The day after Thanksgiving and I had it to myself. 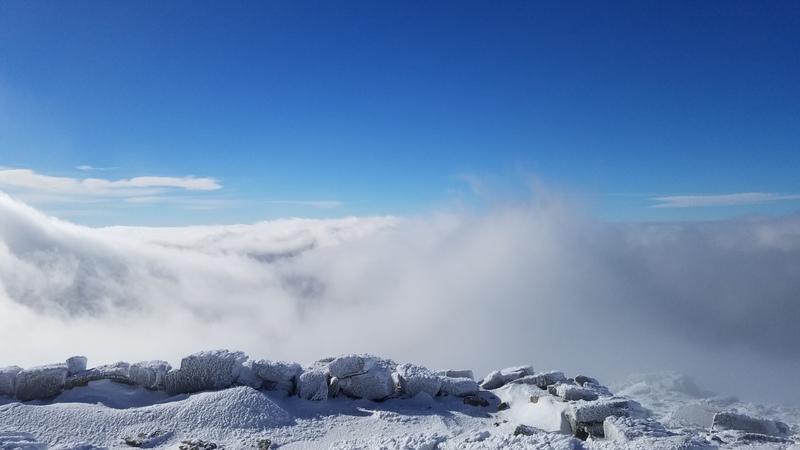 Decided to make a trip up north and do the Franconia Ridge loop as the weather was slated to be ‘clear’. The ridge is one of the best loops (~9.5mi) to do when the weather is nice. The drive went smooth, maybe a little better than smooth due to Dunkin Donuts having their winter holiday flavors. With brown sugar and cinnamon coffee in hand, the highway miles drifted by. I made it to the trail head about 0700 and on trail after suiting up. I was sporting my cheap Lixada microspikes bought on Amazon this year. The lower portions of the trail weren’t completely covered and with several crossings, they were welcome. I did bring my trusty Hillsound Trail Pro but they can be overkill when the trail is a mixed bag. The lower portions of the trail went quick, even with the crossings and ice. There were a couple ice bulges to take caution, but otherwise a nicely packed track. I could only identify a couple fresh prints ahead of me. Guessing they went up before first light, perhaps for sunrise. After getting up beyond the falls the trail begins to climb steady with a few switchbacks. A short spur trail on one of the bends leads down to Shining Rock. It was an impressive sight covered in layers of ice. It is only .1 mile but is down hill to reach it. I returned to the junction and adjusted my layers and had a snack. The weather was overcast and chilly, perhaps 28-30F, but the winds down low were mild. I was heating up a bit and slowed a bit to accommodate. By the time I reached 3200-3400 feet, I was sucking wind and sluggish. Guess I need to get back in shape and get out here more often. I dragged right up until just below treeline. I poked up out of the trees on an icy section and decided to drop back down to adjust layers again. This time I was adding my down hooded jacket, no precipitation, just cloudy. I also adjusted my snacks to make them readily available and took on some water. Once the gear was set, I made the final bump up out of the trees and hit the summit of Little Haystack. The temp remained near mid twenties, but the wind hovering near 25-30 was biting any exposed skin. It was tough to leave my hand out of my glove for too long. I need to get a phone screen friendly glove. I appreciated my hand and toe warmers on this day. On the ridge, the walking was easy, aside from the wind. The trail was mixed ice and packed trail. There were a few spots with drifted snow, but manageable. Mt Lincoln seemed to come quick as my head was down, except for some video shots. I dropped down from Mt Lincoln and found refuge in some low scrub out of the direct wind. I changed out of my damp gloves and put on my backups. If you have chemical hand warmers(ie Hot Hands, Grabber), move them into your new gloves for a minute before switching. This will take the chill out of them and not zap your hands when you complete the switch. With my now toasty hands I continued navigating from the col up Mt Lafayette. I reached the summit, still cursing Mountain Forecast for being wrong.. again. Was thick overcast with biting winds. When I hike solo, I tend to keep moving, but I’m trying to stop and ‘smell the roses’. So I put on my shell coat, dug out some snacks and found a seat. I figured I would hang for 10-15 minutes or until I was too cold. My layering was doing well today so I hung out . A few different pairs of folks arrived having come from the other direction, Old Bridle Path. I took off my shell was packed it and was ready to begin my descent when I heard one of the others mention the sun was trying to break through. Within the 2-3 minutes the overcast dropped to undercast.. sometimes evencast(if there is such a thing). It was one of the most impressive visuals to experience. Till now I had only viewed photos of it online. The winds tossed the clouds into the side of the mountain and up over our heads, then back down. I felt like a tourist and couldn’t put my phone down taking photo and video constantly. It hurt to keep my hand out of my glove for longer than a few seconds so I just kept videoing with my glove on. I think I had a smile across my face the whole time. I kept wandering rock to rock taking it all in, before long all those who were there had moved on and I was alone again. I finally reached a point where I couldn’t keep my hand out any longer and figured I should begin my descent. I tightened up my pack and began my march down toward the Greenleaf hut. Think I was energized by the amazing undercast experience that I was dropping down quickly. The snow filled in much of the gaps and made the descent easier on the knees. Before long I arrived at the hut. I adjusted an annoying twisted microspike and stuffed my down puffy which was beginning to wet with sweat. A quick drink and away I went. The descent down Agony Ridge isn’t too bad until you reach the final drop which is a little steeper and tricky with ice and snow pack. The views back up to Franconia Ridge were beautiful, occasionally in the clouds and some time lit up with sun. Aside from breaking a link on my spike the remainder of the descent went smooth and quick, through some older hardwood forest. The parking lot had filled quite a bit. Even though I was in the clouds for much of the way, the amazing undercast made up for the entire day. Every day in the Whites is a nice day. Falling Waters and Old Bridle Path trail head. Get the rules out of the way. The hut is closed for the winter. No hot soup today. Quickly arrive at more crossings with beautiful falls and cascades. The stunning falling waters still flowing nicely. From another lookout along the descent back up at the Franconia Ridge.